If one looks at the amount of cultivated lands Mission San Fernando acquired and had in production within twenty years of its founding, one can get a sense of the human hours needed to tend to this singular "garden." The total grazing lands of the mission were approximately 50 square leagues, or 350 square miles. The herds of cattle and sheep numbered in the thousands, but goats, pigs, and chickens were also raised. The Indians also planted wheat, barley, corn, peas, lentils, and garbanzos, and maintained two orchards of forty acres each surrounded by adobe walls; in these orchards Indians looked after 1,600 fruit trees: pears, apples, apricots, peaches, figs, pomegranates, oranges, quinces, and prickly pears. The mission also had a thousand olive trees, which were said to produce the finest olives in all California, and 32,000 grapevines. (26) As much as two thousand gallons of wine were produced per season, enough to export to Europe. If you take all this bounty from one mission and multiply it by twenty-one, you can get a sense of the wealth the mission system produced. The missions were like modern corporations, the precursors of agribusiness conglomerates that now exploit the land and farmworkers. Moreover, their labor cost was almost nil. The mission Indians provided the labor necessary for missions, pueblos, and presidios to survive. And it was all produced without paying the Indians so much as one peso. What the Indians received in return for their labor were the trinkets of civilization, some hymns to sing, and cheap clothes, all cut from the same cloth in the same style. They also received the rituals of Catholicism, including marriage and baptism. But for the thousands who were baptized and then died of overwork, disease, or other causes, there's no proof that any of them are in heaven. There isn't one painted image, for instance, showing an Indian at the side of God. Just imagine the contradiction: if Indians are in heaven, they must be working the fields while the padres drink wine and smoke cigars. And yet that was the point of the missions, to save the Indian souls, to make them candidates for heaven. But how much did the missionaries really care about the Indian soul? There is no campo santo for the Indians in any of the missions, no holy ground where their bones rest. In all the missions, where exactly the Indians are buried is a mystery, and this lays bare the myth that the padres were concerned about them. Mass graves? Single plots? Each mission merely has a marker of wood or stone that says so many thousand Indians are buried here. But where exactly is here, no one knows. I imagine the missions as charnel houses of bodies and bones, with the quiet of mornings and evenings broken by the sounds of sorrowful people crying incoherent rants against punishment received for sins never committed. 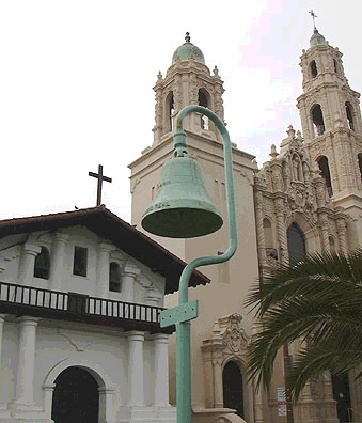 The oxidized bells [near the Missions] were the idea of a woman whose husband owned the only bell-making factory in the west. Because the past is painful in California, we have fabricated a history for the missions that is pure myth. Let's just get it over with and admit that it's not only a myth, but a pretty deliberately fabricated one. None of the romance is true. The mission myth of California is the unintentional result of a novel about California Indians after the mission era, coupled with the more deliberate effort of magazine editors who sold California as a paradise, a land of sun, health, and romantic missions. El Camino Real never existed. (31) No royal "king's" road ever linked the missions, not ever. The missions were not one day apart, as is commonly believed. (32) The oxidized bells along the side of the freeway were the idea of a woman whose husband owned the only bell-making factory in the west. But the honor for actually placing the bells in 1906 goes to the Camino Real Association. (33) The friars wore gray robes, not brown ones (as they are usually depicted), till the 1890s, way after the mission period ended. (34) The whole "mission" myth is a Hollywood script, a public relations coup, history without substance. The myth is started in part by Helen Hunt Jackson's novel about California Indians, Ramona, and then seems to take on a life of its own. This is not meant as a judgment on Helen Hunt Jackson's intentions, which were nothing but the best. John Ogden Pohlmann points out that she was a vocal advocate for Indian rights, as her other books testify: A Century of Dishonor (1881), and, with Abbot Kinney, Report on the Condition and Needs of the Mission Indians (1887). In the end, though, it's her series of articles on the missions for Century magazine that first solidifies the romance of the missions and sets the tone for how most other writers will approach them as romantic historical ruins (seemingly always seen by moonlight). (35) But in the sunlight, a different picture emerges. Regardless of the stain of the missions, not all missionaries could possibly be ogres. I'm sure most of them died like Serra, owning nothing more than their gray habit and two undertunics. That they were human, yes, that their errors of judgment had disastrous consequences for native people is also true. Considering the tradition of Franciscans like Bernardino de Sahagun, the California missionaries appear surprisingly incurious about the indigenous communities they lived among. (36) They did not come to learn, to share, to commune. They came to impose their will. They had a unique opportunity to interact with native societies, in a land blessed with everything, but they approached their self-created task like brutish, bullish schoolteachers who brought discipline, work, prayer, and so-called progress (read destruction) to the native communities they encountered. The missions are a complete failure in transitioning the native people into Spanish or Mexican society instead the indigenous communities are overwhelmed by the presence and power of the missionaries and soldiers. The missions were never meant to be permanent fixtures, but rather temporary structures to be abolished once the Indians could sustain themselves. As usual, things never quite work out the way they're planned, and thus, not until the Mexican government insisted did the priests give up control of the missions. Even writing about the missions seems in some way to defeat their own temporary purpose. I can admire those who came here across the desert of Sonora or Baja California, hauling their meager belongings in oxcarts, and built the first pueblos. But I am not in agreement with the price that Native Americans paid so that the mission system (and later the pueblos) could flourish, so future generations of tourists could feel connected to a romantic past, intentional or unintentional. My memories of the mission period are not in sync with what is portrayed in the myth or in the tours and dioramas that tourists see when they visit these sites. I identify with the Indians, not with the priests or the Spaniards. Why don't we romanticize the Native Americans, whose past represents the real origins of California, and who were the first settlers as it were? Instead what we romanticize is their destruction. So, from my perspective, the "good old Mission days" never existed. 25. 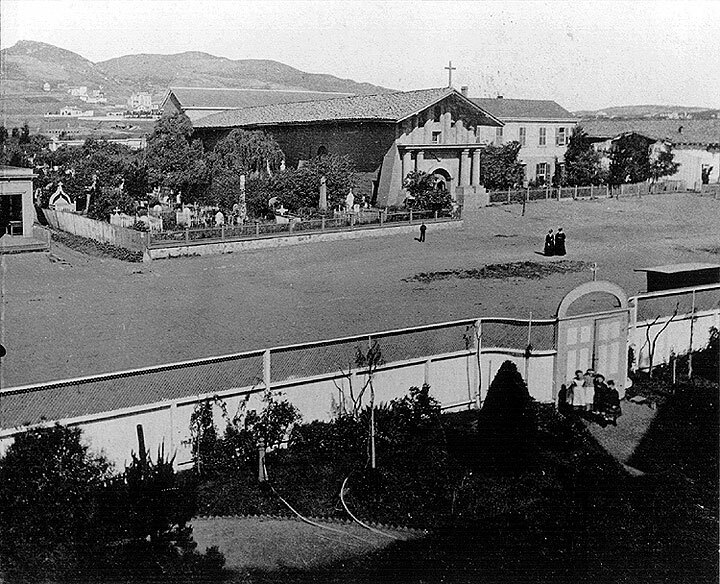 Francis J. Weber, Mission San Fernando, 7-10. 26. Ibid., 16. 27. Tinker, Missionary Conquest, 51. 28. Fogel, Junipero Serra, 14. 30. Jose del Carmen Lugo, "Vida de un ranchero," 227. 31. John Ogden Pohlmann, "California's Mission Myths," 157-158. 36. Robert H. Jackson and Edward Castillo offer a similar observation in their book Indians, Franciscans, and Spanish Colonization:. The Impact of the Mission System on California Indians, 35.